Strava had 1 billion activities recorded in 2017; it’s fair to say that it’s an extremely popular cycling (and running) social platform. Recording your ride, getting inspired by friends and competing against that one annoying local who has obtained what feels like an unachievable segment win can be super addictive. You may have recently read the story about the US army accidently giving away the location of its secret bases on the Strava app. In November 17, Strava released a global heatmap showing every activity uploaded to Strava. The maps are detailed and they’re visually impressive. But, they are not ideal for national security when soldiers have uploaded their jogging routes around army bases and beyond. When it comes to cycling and top end bikes, organised bike thieves are watching what information is publicly available when finding victims. It’s easy in the world we live in, with social media, for thieves to monitor for high end bikes and easily join the dots to find where those bikes are stored. So, just like being wary of posting a photo of your new 5k bike on your open Instagram profile, showing the bike and shed it’s stored in (with #thepad #newride #1A #SummerFieldLane #londonfields), it’s wise to check those Strava privacy settings! That is particularly important if you upload photos of your kit and also start ride recordings from your house. Under ‘Enhanced Privacy Mode’ you will find the option to switch on ‘Enhanced Privacy’. This includes anonymising your name, hiding your activities and the all-important bike photos from your non-followers. Other privacy options include making activities private by default on upload. You can hide your home location (or your bike storage location) on activity maps. Pop the location (or locations) in and set a privacy zone as it mentions. All these locations will display under a section titled ‘Your Hidden Locations’ once added. Be aware that this privacy zone is quite basic and only covers a relatively small area. A recent analysis, as noted here, shows it can be quite easy to work out a midpoint between the circled zones. We would say that if bike thieves are extra committed and know your ride patterns (times, route), they might also decide to monitor the rough location to follow you home. So consider adding the other privacy options. 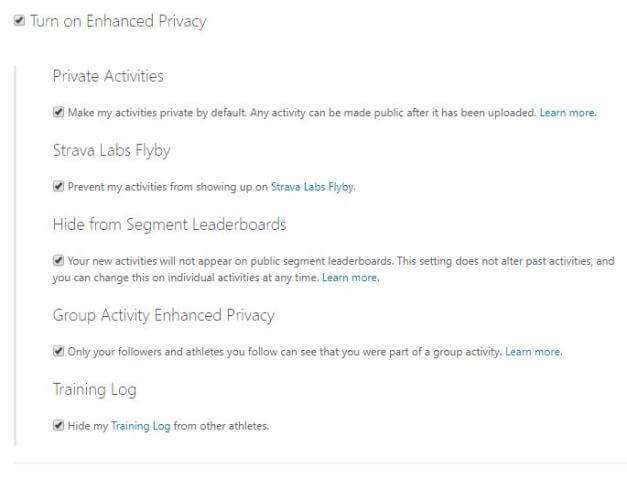 You may find after all the recent news coverage about Strava that the privacy settings mentioned above might become clearer. If you use another GPS cycling related app, double check the privacy settings to make sure you are not exposing things that might put your bike at risk. As with everything online, be careful and think like a criminal when it comes to protecting yourself from bike theft. Strava Heatmap, zooming out from London.